This document discusses specifics related to Mozilla's Firefox development model. Discussion should take place on dev-planning and changes should be submitted as pull requests on GitHub. The repositories can generally be grouped into two overall processes: development and release. Project repositories and mozilla-central are part of the development process. The downstream repositories are part of the release process. This document mainly covers the release process. Details about project pages, feature tracking, and bug management are out of scope for this proposal and will be discussed soon. Users willing to help test early versions of Firefox during the last round of stability refinement. When a build is offered on this channel it means a new version of Firefox has been officially released. Preffing off and backing out fixes/features which the central channel exposes as problematic with a wider audience. We aren't using "a" and "b" as it would be confusing as it relates to aurora and beta. Gecko versioning will tie into Firefox versioning regardless of the Firefox version scheme above. For Firefox 5, the gecko version will be 5.0, for Firefox 6, 6.0, etc. There will be 8 or so locales that track mozilla-central, localizing alongside en-US development. Other locales can track mozilla-central if they would like to as well but they won't be asked to explicitly. mozilla-central will be string frozen for en-US at the mozilla-central → mozilla-aurora merge point. No en-US string changes will be allowed on mozilla-aurora. The mozilla-central → mozilla-aurora merge date will happen on schedule so the string freeze should not come as a surprise. For locales that don't track mozilla-central, their work is done in l10n-aurora, which tracks mozilla-aurora. This means most locales have 6 weeks to complete their localizations. In general, each stage of the process (and activity pertaining to a particular version) lasts for 6 weeks. Please do note that chemspills / rapid response updates are not reflected in these schedules and will be dealt with on an as-needed basis. The following describes the mozilla-central to mozilla-aurora mechanics. 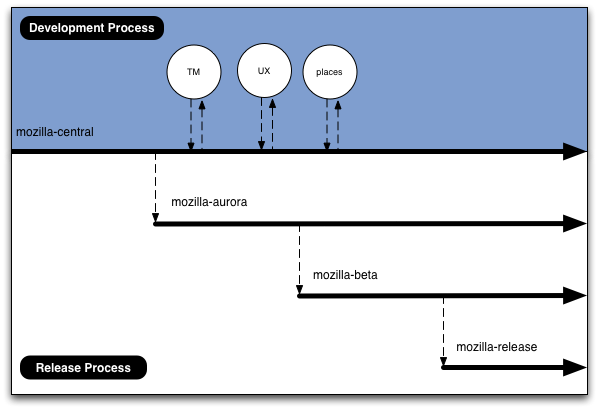 mozilla-aurora to mozilla-beta mechanics follow the same steps, with the exception of tagging (use BETA_BASE_YYYYMMDD), and versioning (strip off the a2 suffix). Never delete the aurora repo, we need the history. Tag and close old head on aurora. Push from m-c to a new head on aurora. Human needs to review list of changes since the last AURORA_BASE_YYYYMMDD tag, and figure out which changes to bring forward, and which changes to throw away. Use "hg transplant" to take the changes we want to bring forward and bring over to the new head. Make note of the related bugs, and comment in them to notify the relevant stakeholders that they've been transplanted to mozilla-aurora. Human needs to resolve any merge conflicts. No work is deferred from upstream repos to downstream repos. If your feature / change isn't finished on mozilla-central, mozilla-aurora is not the place to fix it up. If there is outstanding work on mozilla-aurora do not plan to fix it in mozilla-beta. The clone / pull dates are published far in advance so there should be ample time to plan. If it's not ready it should be backed out or preffed off. There will be another release in 6-12 weeks for the fix to try to make it in again. Cloning between repos will happen on schedule. Again, consistency is key. Groups will be able to plan and won't need to be intimately involved with the release process to know where fixes are and where fixes should be landed. When the time comes to merge upstream release repositories with downstream repositories we are essentially replacing the downstream repository with a copy of the upstream. Because the merge/clone should never fail and it happens on a set schedule it will likely be automated. When cloning from mozilla-central to mozilla-aurora the backouts and pref offs take place on the mozilla-aurora repo. This allows mozilla-central to use the complete allotted time for development and utilizes mozilla-aurora's time for convergence.